Along with providing music reviews and opinion pieces here at The Couch Sessions, I also run my own site, a brother site of sorts to the Couch Sessions, True Genius Requires Insanity at TGRIOnline.com. 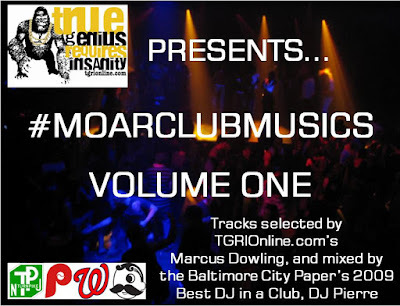 As with most blogs we (I have a staff of eight along with me) attempt to provide comprehensive coverage of all music, however, we have a particularly strong lean toward dance music, with an emphasis on Baltimore club. To that end, TGRIOnline.com is now presenting compilations of our favorite sound. Entitled #MOARCLUBMUSICS, the mixes intend to be a combination of club classics that everyone knows, integral tracks by those key to the sound, tracks made by those just as deeply influenced by and fans of the sound as we at the site are, as well as providing an introduction to those we feel will be major innovators keeping club music alive for the next generation. The mix is curated by the site, namely me, and mixed by DJs we feel are indicative of and aspiring to the level of legend that the sound has generated. DJ Pierre is a rising star. Still under 21, he was already voted the 2009 Best DJ in a Club by the Baltimore City Paper. He’s risen quickly to prominence and spins weekly throughout Baltimore and has amassed quite the sizeable following in the past year. His developing production style and his skills as a DJ will be clear and obvious by the end of the mix. From current scene godfathers like Emynd to legends like KW Griff, Scottie B and Rod Lee, to those influenced by the sound like DC’s Nouveau Riche crew, Philadelphia’s Federation Sound collective and NYC’s Cousin Cole, alongside criminally underrated local talents like James Nasty, and the youth of someone like Murder Mark, this mix indeed achieves the impossible and is everything to everyone.